Discussion in 'Classic Manual Cameras' started by troll, Jul 23, 2004.
name so powerful, or what? Possibly, Zeiss-Ikon often meant high quality. So it possibly was seen as a viable alternative to the pricey Rolleiflex. On the other hand, Rollei had the lower-priced Rolleicord. Charles Barringer and Marc Small get into this a little in their book. In the end, it didn't make much sense for Zeiss-Ikon to continue making a TLR, especially when they also had their much-respected Super Ikontas in the catalogue. "Compendium: East and West-1940-1972 : Zeiss Ikon in the Postwar World"
Zeiss-Ikon was such a giant in those years that they never seemed to pull out of anything. Their catalouge contained an exagerated amount of cameras often competing with each other. Take the prewar 35mm cameras: They have the flagship Contax II/III, the Super Nettel (a folder), the Nettax (a "cheaper" RF), the Tenax(a quickfire square format), Contaflex (outrageously priced TLR)and an older Contax I which is still available on their catalouges....anything else they could have made in 35mm format? Zeiss-Ikon's biggest enemy later in the 60's and 70's probably wasn't japan, but it's inability to narrow it's production and hold some of it's profitability. They just kept making the Contessa (rigid vf), the Tenax, the Symbolica....three names for the same mediocre camera with was being outsold by the japanese cheap wonders. I've always entertained the notion that, pre-war, Zeiss attempted to compete with everyone. Hence the Contax was designed to compete with the Leica, the Ikoflex with the Rolleiflex and the Superb with the Rolleicord. The Ikonta range competed with everyone else. Given their size and financial muscle this was a strategy that made sense. The sheer size of their operation meant they could support white elephants like the Contax TLR which was, in fairness to the company, built up to a standard, not down to a price. Post war austerity made them reconsider their strategy and they seem to have rationalised their range quite dramatically. I'd be really interested if anyone has any further information on this. Bill, months ago, I bought a mint IIa (855/16 - 1953-1956). It is an Ikoflex Favorit without the light meter. It came with the box, instructions, lens cap, and the ever-ready case. All in mint condition and it takes wonderful pictures. Later on, I bought the 2 close-up lenses. The IIa viewfinder is described as "brilliant" having a Fresnel + a condenser lens. For this reason, it does not show light fall off, being very easy to focus + composing and comparing it with all my 'flexes and 'cords with the original factory installed ground glass, the Ikoflex blows the latter ones out of the water. 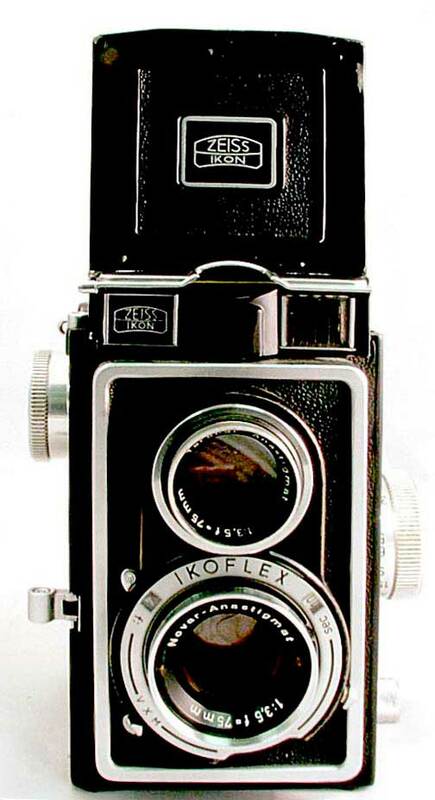 As you know, I'm a Dagor lens fan and to my surprise, I learned that, the Ikoflex was a Goerzwerk Berlin product. Heavy, with a beautiful Art-Deco style, and well made. I haven't any experience with Ikoflex IIA, but my estate sale Rolleicord V definitely needed a perplex viewfinder screen and is now quite useable. It's a nice, plain and simple TLR. Afer looking at the shutter release location on just on the Ikoflex a few minutes ago, I can see an improvement there as well. Since, I always use a cable release with the Rolleicord as it has a combined lever to tension and release the shutter. You say the Ikoflex is a heavy beast. I find that interesting. Since, I have a Zeiss-Ikon Super Ikonta B that is a dream come true on windy days. The Rolleicord V is way lighter by comparison. Sometimes I'm afraid it might blow away if the wind picks up a bit. If the Ikoflex is built anywhere near the standard of the Super Ikonta B, it must be as solid as a battleship. Andrew, after reading your post, I weigh my Ikoflex IIa at 2lbs/8oz x Rollei MX-EVS at 2lbs/5oz x Rolleicord Vb at 2lbs/1oz. I love my Ikoflex IIa. I like it better than a Rollei. I like the knob wind and automatic film stop and the shutter sound. The shutter button is my least favorite part, its difficult to use withour causing camera shake. I hate the bayonet filters on the Rollei, much prefer the Ikoflex's 35.5mm screw mount. I would say the Ikoflex is equal quality to the Rollei, its certainly as heavy. Perhaps the lenses are not quite as sharp as the best Rollei ones but I'm not obsessed with sharpness. Unless you want the Planar/Xenotar lens, Ikoflex with Tessar is a good as a Rolleiflex and better than a Rolleicord. I have several of each. I would definitely prefer the Ikoflex over the Yashica and most of the other Japanese TLRs. My II has a Tessar and My IIa (second version) (built like a tank) has a coated Opton Tessar (No Xenars). That's a great point re the superior shutter button on various Ikoflex models. My Rolleicord Vb has an awful double action lever to charge and fire the shutter. the pedestrian Rollei ground glass. My TLRs are 'second-string' and that includes my Ikoflex 1c (summary at Zeiss Ikoflex Ic ). In the Novar lens version which I have, the optics are nowhere near those of Rolleiflex (who, somewhat ironically, got the best Zeiss Ikon lenses). Like so many Zeiss products, overcomplex and less convenient to use than competing products. The Compendium book referenced above tells the sad, sad story. Mind you, I am a great fan of Zeiss, but somehow they just overdid things to the point where profit was minimal. FWIW, I was happy with an Ikoflex Ib with Novar lens, which I bought to see if TLRs were for me. The Novar was OK at f/8 and below, and I got several good pictures from it. Then I gave the Ikoflex to a friend and got a Minolta Autocord, which is my main 120 camera now. I also have a Rolleicord Vb with Tessar, which is nice, although I do not like the darn double-action shutter because of the lateral movement needed to release. My favorite TLR is the Minolta Autocord. The film stays really flat and the lever focus is really nice. The Ikoflex just seems more complex than necessary. Aside from the 620 film, my favorite medium format TLR camera is the Kodak Reflex II. Pin-sharp 80mm f/3.5, 4-element dual Anastar lenses and the first TLR to employ the Fresnel lens. Was brighter than any other at the time.